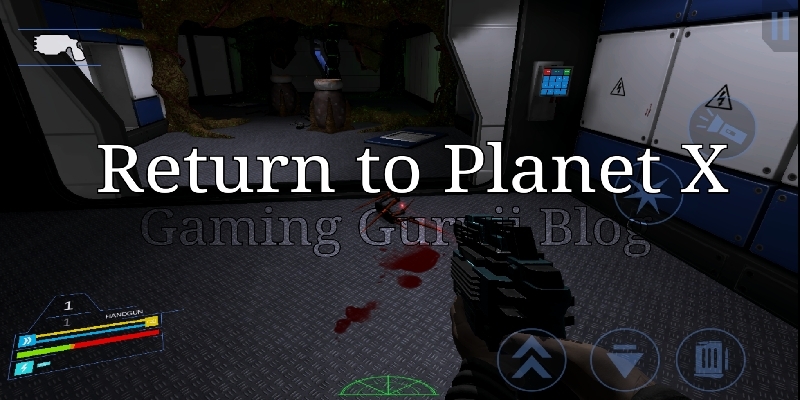 Today Gaming Guruji has brought you, Return to Planet X, which is another premium action game for android and if you loved to play Slaughter 2 game than you are going to enjoy this action game too. Game story is something like that you are all alone left in another planet at some secret military base, all your other teammates has been died and now you have to complete the mission all alone where you will face alien bugs who looks like spiders. You will find weapons, medical kit and other stuff in safe. To open the Safe, just go near to it and when you see a wrench symbol on that just toch that.. That is how you interact with objects in the game. Return to planet x game may be liked by those who love to play offline and less violent game, if you love to play offline first person shooting game and violence than you should try Modern combat 4 or Max payne on android device. This game's sound create the game environment so scary and as there is not much light and you'll see Skeltons, dead alien bugs and some other stuff, you might not have seen in other games. As far as armour you get in this game, Return to planet x, are Laser guns, grenades, explosives, machine gun and flamethrower. I would say game is good and you can try it if you play offline games and you are kind of first person shooting game lovers as It is the first person shooting game. Because of good graphics and different kind of Game story, you'll definitely enjoy it but what I found that game controls are bit different in the game which you can not customize except sensitivity but it's ok.
Get the RTPX data that are mostly in obb format. Extract the Return to Planet X Game obb file by using any zip extractor. Now after extracting you have a folder with obb file(s). Put this folder or directly extract into the location internal memory/Android/obb/. Extract apk from zip file and Install APK. You can get Return to Planet X game from play store at $8 or ₹590 or check out the below links.